Theme park getaways are great family summer vacations, and with so many options for thrilling fun, there is a perfect park for everyone to visit. No great vacation can be thrown together quickly, even for parks where everything seems to be included within the gates. Proper planning can help guests pick the best park, get their tickets, pack appropriately, and generally ensure a fabulous vacation. Classic Amusement Parks: These parks have very little theming, such as named lands, rides with integral stories, or costumed employees. Instead, they offer classic thrills with carnival rides, roller coasters, games, entertainment, and sweet summertime treats for visitors to enjoy. 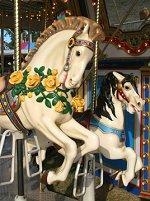 Cedar Point amusement park is a clear example of a classic park with only basic theming. Basic Theme Parks: These parks sacrifice smaller rides and attractions for the sake of introducing elaborate decorative schemes and coordinated designs throughout the park. This creates a microcosm of fantasy, culture, and fun that truly makes the vacation feel out of this world. Disneyland theme park in California as well as other Disney parks are great examples of elaborate theme parks. Water Parks: These parks focus almost exclusively on splashy attractions such as water slides, wave pools, fountain play areas, and other aquatic attractions. There may be a beach and other water sports available as well, but very few dry attractions. Noah's Ark water park in Wisconsin Dells is a great example of a water park, as well as the other Wisconsin Dells water parks. Zoo Parks: These theme parks offer not only rides and other amusements, but also a range of exotic animals, reptiles, and birds in different habitat exhibits. At the same time, the park does not necessarily carry the zoo theme to other parts of the park. Busch Gardens in Tampa and Wild Adventures in Georgia are both zoo parks. Marine Parks: Marine parks are a specialized type of zoo park that focuses on marine and aquatic animals. More than an aquarium, these parks offer guests a glimpse of exotic ocean mammals, fish, sharks, and other creatures of the deep along with rides and interactive experiences. Sea World in San Diego is a superb example of a marine park. Good parks are fun for everyone. What attractions does the park feature? Every park has different rides, shows, and other attractions. Choosing a park that is interesting to different family members is a key step in finding a great theme park destination. Is there something for all ages? Young children will love playground areas, costumed characters, and simple amusement rides, while teenagers may be more interested in roller coasters and other thrilling options. The best parks offer something for everyone. Is the park affordable? Ticket prices for large amusement parks can be high, and prospective guests should investigate different price ranges to find the best park for their budget. Many parks offer discount tickets online and promotional offers early and late in the season, and annual passes may be a great bargain for a longer getaway. Don't forget to figure additional costs such as parking, hotels, and meals into a park's affordability as well. When is the park open? Understanding when the park is open and different hours during different times of the year should be a factor in planning a theme park getaway. Some parks operate on weekends throughout the year, while others are only open during the summer months. Parks that have shorter seasons may be more crowded than parks offering longer calendars. Once guests have chosen the best park for their vacation, the next step is purchasing tickets. 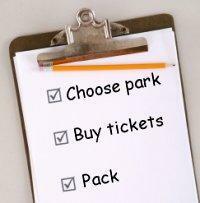 Buying tickets online can be a great savings, helping reduce the overall costs of the vacation. Season passes are often a better deal if guests will visit the park for several days, and many parks also offer combination tickets with other nearby attractions or other parks, giving families many options for an extended vacation for one low price. If tickets cannot be purchased online (check the park's official website), plan to arrive early the first day of the getaway in order to wait in line for tickets. Ticket counters typically open shortly before the main gates of the park, and early guests can take advantage of this to be sure no time in the park is lost. Comfortable, loose clothing in light colors to help stay cool. Sunscreen, sunglasses, hats, and other protective clothing. Cameras and plenty of film, extra batteries, or memory cards to capture all the fun. A park map or brochure (these can be requested through the mail, downloaded from websites, or picked up at the park gate). A small bag for carrying essentials in the park. Sports bottles for drinks or water to stay hydrated. Extra swimwear, goggles, and other necessities if visiting a water park. Comfortable shoes that won't cause blisters. Medication for motion sickness, headaches, outdoor allergies, and other ailments that may be a problem. By knowing which type of park to choose and how to plan a theme park getaway, families set themselves up for exciting and memorable vacations at the more than 1,000 theme parks around the world.